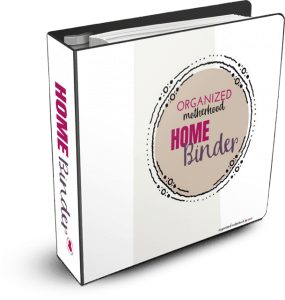 Are you tired of the overwhelm that the holiday season brings? Isn’t Christmas supposed to be a time of joy, not stress? 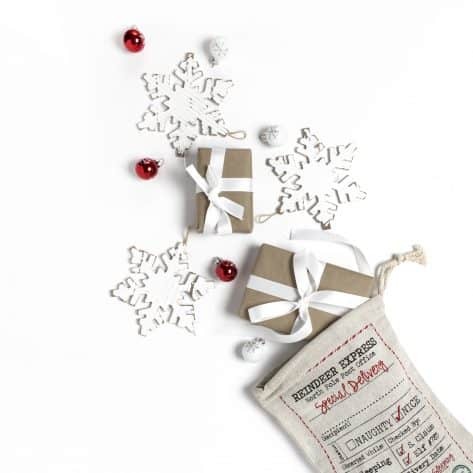 I usually host Christmas Eve and Christmas Day, and the days leading up to Christmas can be a whirlwind of shopping, cleaning, decorating, wrapping, and mailing last-minute Christmas cards with the hopes that people receive them before Valentine’s Day. For the past few years, I’ve been saving my to-do lists, menus, and card list from year to year. 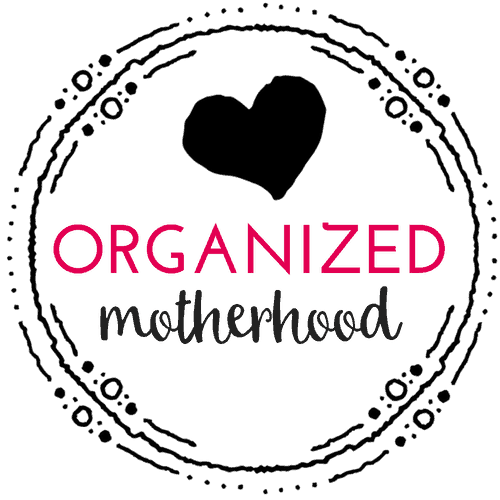 I made them pretty and put them in the Organized Motherhood Holiday Planner. 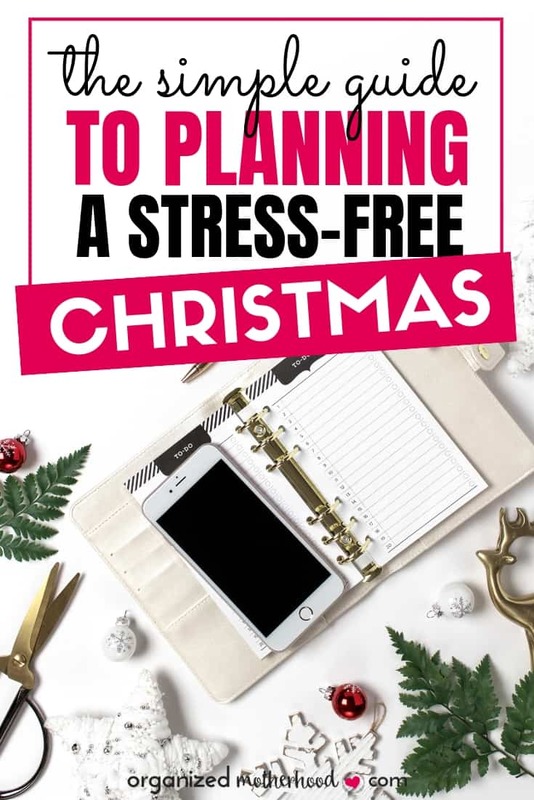 It’s made my Christmas planning simple. Yes, there are still things that have to be done at the last minute. But at least I know they’re coming and can plan for them. 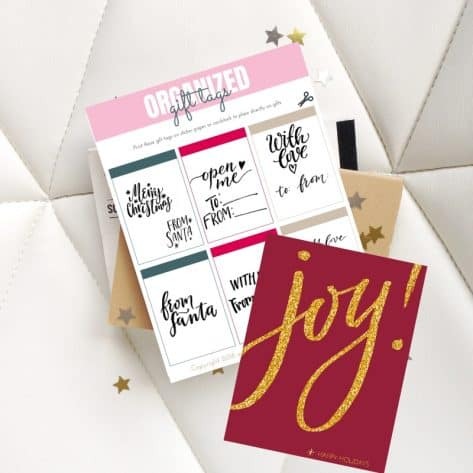 If you’re struggling to stay sane this holiday season, get your free copy of the Organized Motherhood Holiday Planner. Then follow these tips! 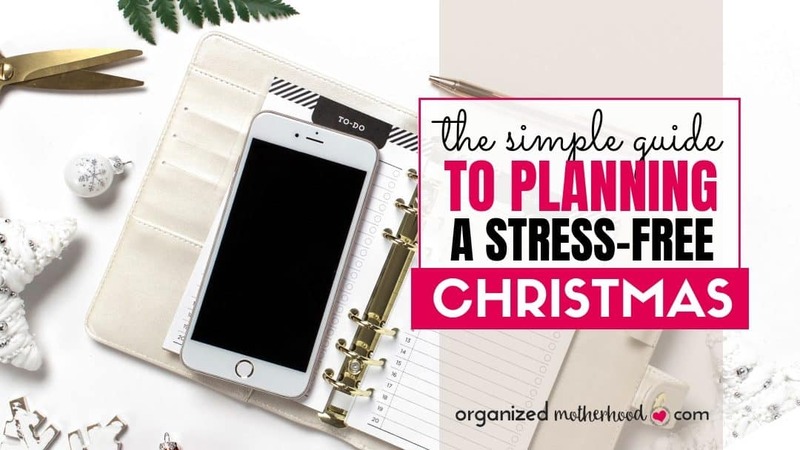 This Christmas season, you can plan to have a stress-free, simple holiday. With a little planning (and these easy tips) you can get ready for a fun, happy, enjoyable holiday! Here’s how to have an organized Christmas. Before you start planning a party, think of a theme. Don’t worry, it doesn’t have to be complicated, but having a themed party will help you decide what food to serve, who to invite, how to decorate, and even how to dress. You can make the theme more exciting by adding fun requirements like a white elephant gift exchange or an ugly sweater requirement. Once you have your theme, plan the menu, send invitations, and start cleaning and getting ready! One of the most stressful parts of getting ready for Christmas, especially if you have little kids or a large extended family, is buying (and keeping track of) gifts. To make things easier on yourself, start by buying gifts throughout the year. When you find “the perfect gift,” think of something unusual, or find something on sale, buy it. You can either wrap it immediately or save it in a designated place. Just make sure to label it and keep track of everything that you’ve already bought. Depending on whether you prefer paper or digital planning, you can do everything from making a list of the gifts you plan to buy, bought, and a stockpile. You can even make a column and track your budget. If you prefer keeping track of everything digitally, make a spreadsheet or track your holiday plans in Trello. It seems crazy, but it’s a really good idea to start cleaning and getting ready for the holidays a month in advance. It’s never too early to clean the guest room, vacuum the walls, or deep clean your house to get ready for the holiday season. Some tasks, like vacuuming, dusting, and doing a quick cleanup, are best left as last-minute tasks. However, try to get as much of the deep cleaning done early. 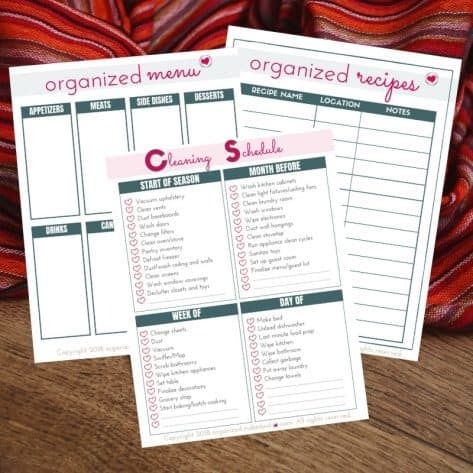 Download my Christmas cleaning planner as part of the 2018 Organized Motherhood Holiday Planner to stay focused (and be able to ask for help without nagging) this season. Every time you host a party, plan your menu ahead of time. Write down all the dishes you’ll make, and plan your grocery list as you’re planning your menu. As people RSVP and ask to bring items, cross them off your list. If you’ve hosted a holiday party before, reuse the same menu. Ask people to bring the same dish they brought before. As you set your table, label your dishes. This is helpful so that you don’t forget anything on the day of the party. It’s also great because you can ask guests who arrive early to put dishes out. As you receive holiday cards, save the return address labels. Use these to create your list and make sending cards easier. 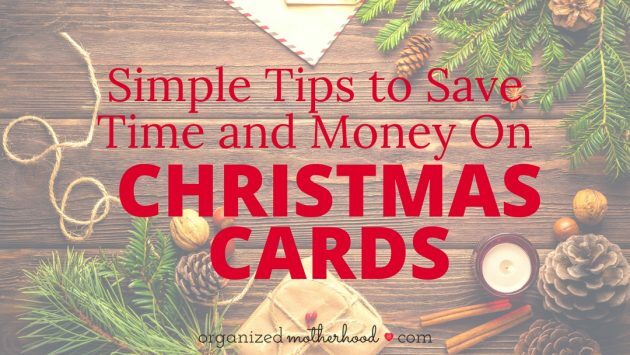 Read this post for more ideas to save time and money on Christmas cards. Make things simple on yourself this holiday. One of my favorite takeaways from the book The Nesting Place was the idea to “quiet a room.” Take everything out, assess the room, and then put back only those items that you love. As you’re decorating for the holidays, make sure that you’re only putting out the decorations that you love. Don’t be afraid to try new things, like putting a decoration in a different place, but if something’s broken, doesn’t fit in your home, or no longer brings you joy, get rid of it. Also, as you’re setting out decorations, take some time to label the boxes to make it easier to put them away. Once you’ve decorated, take stock of what you have left. Do you have lights that you don’t need or ornaments that you don’t have room for? Donate them. Rather than save them “just in case” or “until next year,” save yourself some work and declutter them now. 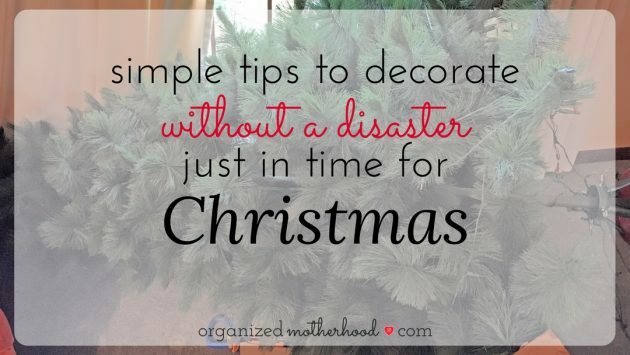 Read this post for more ideas to save time and money decorating for the holidays. 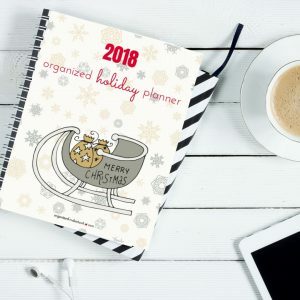 Download the free 2018 Organized Motherhood Holiday Planner to stay focused as you get ready for the holidays.